Nitrogen is arguably the most important nutrient required by plants. However, the availability of nitrogen is limited in many soils and although the earth's atmosphere consists of 78.1% nitrogen gas (N2) plants are unable to use this form of nitrogen. To compensate , modern agriculture has been highly reliant on industrial nitrogen fertilizers to achieve maximum crop productivity. However, a great deal of fossil fuel is required for the production and delivery of nitrogen fertilizer. Moreover carbon dioxide (CO2) which is released during fossil fuel combustion contributes to the greenhouse effect and run off of nitrate leads to eutrophication of the waterways. Biological nitrogen fixation is an alternative to nitrogen fertilizer. It is carried out by prokaryotes using an enzyme complex called nitrogenase and results in atmospheric N2 being reduced into a form of nitrogen diazotrophic organisms and plants are able to use (ammonia). It is this process and its major players which will be discussed in this book. 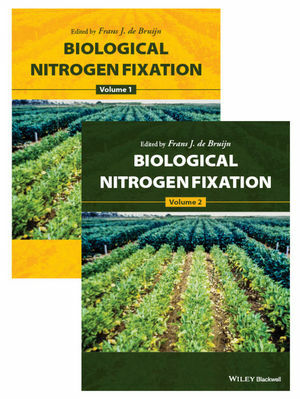 Biological Nitrogen Fixation is a comprehensive two volume work bringing together both review and original research articles on key topics in nitrogen fixation. Chapters across both volumes emphasize molecular techniques and advanced biochemical analysis approaches applicable to various aspects of biological nitrogen fixation. Volume 1 explores the chemistry and biochemistry of nitrogenases, nif gene regulation, the taxonomy, evolution, and genomics of nitrogen fixing organisms, as well as their physiology and metabolism. Volume 2 covers the symbiotic interaction of nitrogen fixing organisms with their host plants, including nodulation and symbiotic nitrogen fixation, plant and microbial "omics", cyanobacteria, diazotrophs and non-legumes, field studies and inoculum preparation, as well as nitrogen fixation and cereals. Covering the full breadth of current nitrogen fixation research and expanding it towards future advances in the field, Biological Nitrogen Fixation will be a one-stop reference for microbial ecologists and environmental microbiologists as well as plant and agricultural researchers working on crop sustainability. Chapter 13. How Does the DraG-PII Complex Regulate Nitrogenase Activity in Azospirillum brasilense? Chapter 17. Phylogeny, Diversity, Geographical Distribution and Host Range of Legume-Nodulating Betaproteobacteria: What Is the Role of Plant Taxonomy? Chapter 23. The Genome Sequence of the Novel Rhizobial Species Microvirga lotononidis Strain WSM3557. Chapter 99. Nitrogen Fixation with Soybean: The Perfect Symbiosis? Chapter 110. Conservation of the Symbiotic Signalling Pathway between Legumes and Cereals: Did Nodulation Constraints Drive Legume Symbiotic Genes to Become Specialised During Evolution? Chapter 114. The Microbe-Free Plant: Fact or Artefact?